Since it’s introduction in 2004, the Honda TRX450R has shown versatility and staying power only matched by Honda’s legendary TRX250R. Winning races from one end of the racing spectrum to the other, be it Baja, National MX, WORCS, GNCC; the 450R has shown it is the machine of choice for those serious about winning races. Relatively unchanged since its inception, it is the top choice for non-factory Pro racers and amateur racers alike. 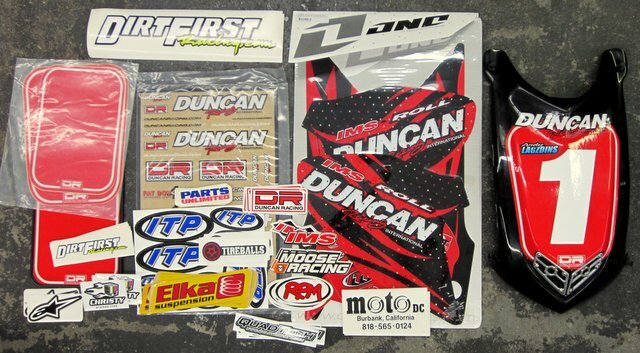 DirtFirst has been building race winning 450R’s since 2004, with Team riders winning state and national titles on these fast and reliable machines. 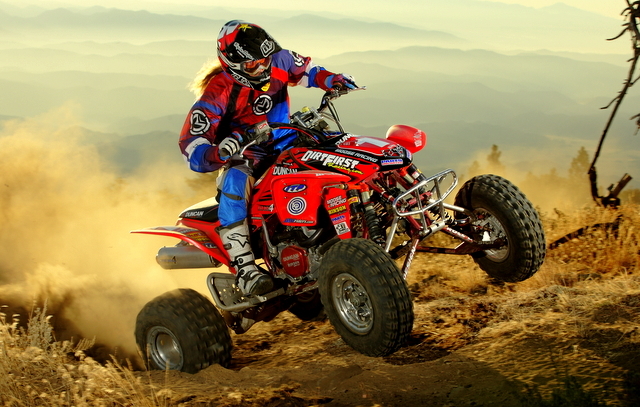 In this segment we will show you the step-by-step assembly of a race ready TRX450R that DirtFirst rider Andy Lagzdins will campaign during the 2012 season. 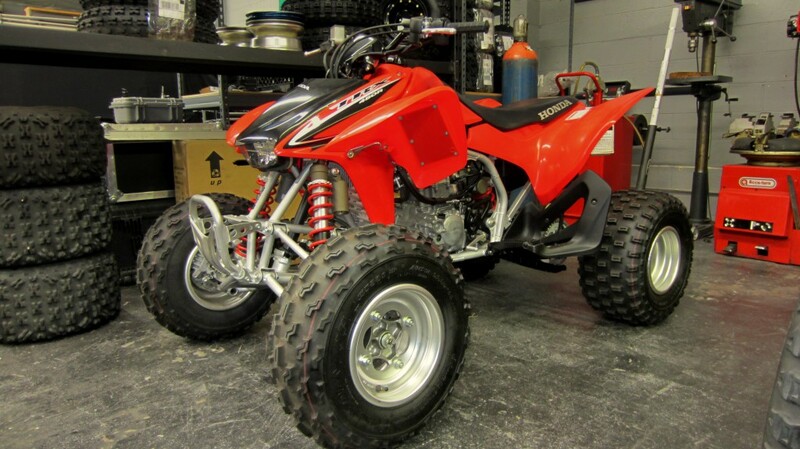 The first step is to find a stock quad to use as the starting point. 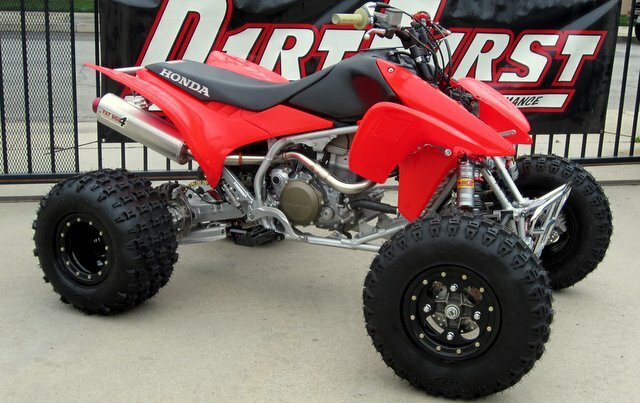 We found this leftover 2008 TRX450ER at a dealer in SoCal, and picking up a leftover is a less expensive alternative to buying a current year quad. The TRX450R did not receive any major changes from 2006 to 2012, so any model you can find in that year range is basically the same. 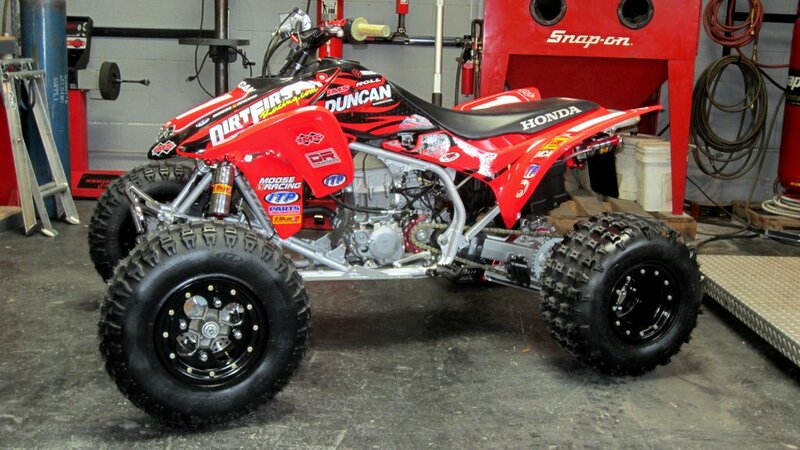 Here is the quad stripped of all the parts we are not going to use. It is best to just get all that stuff out of the way and boxed up to reduce the amount of parts in the work area. 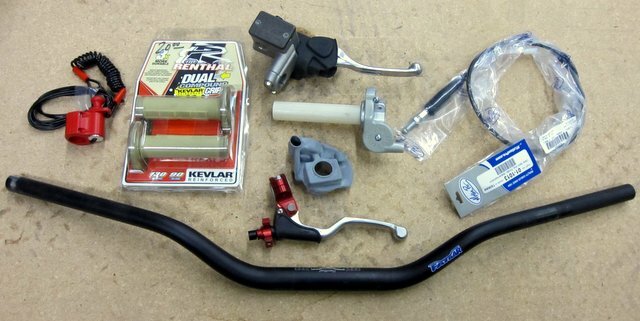 These are the OEM parts that will be used. 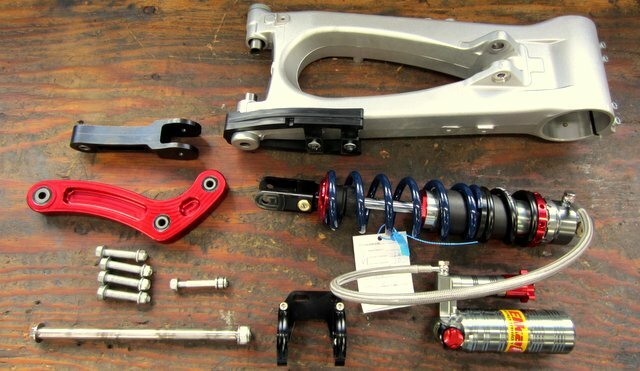 The 2008 swingarm, front hubs and spindles have been swapped out with 2005 TRX450R parts to work with the suspension components that we are going to use. We will start bolting on the front end components. 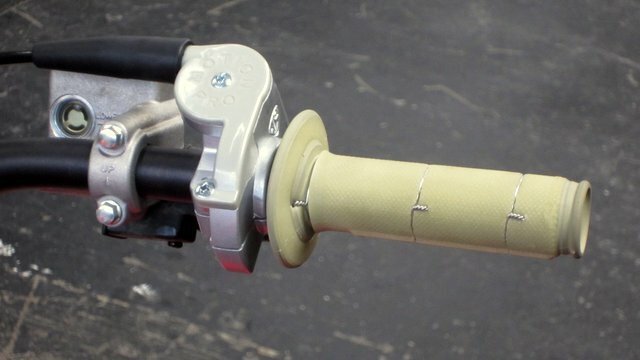 Here is the steering stem, a Roll Design +1″. These stems use castings at the top and bottom, both welded to the CrMo main tube. 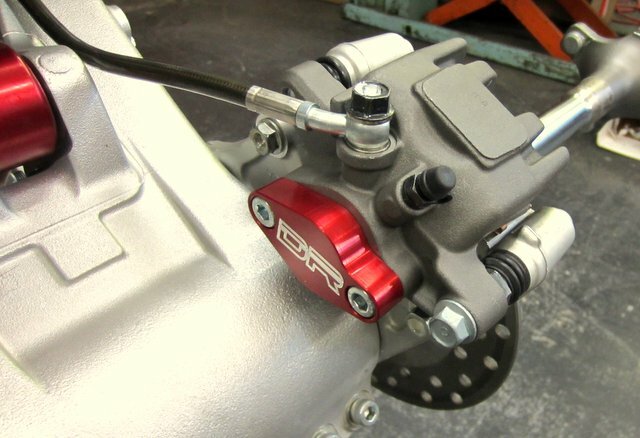 The GPR damper is a low-mount that bolts onto the frame just behind the front bumper. 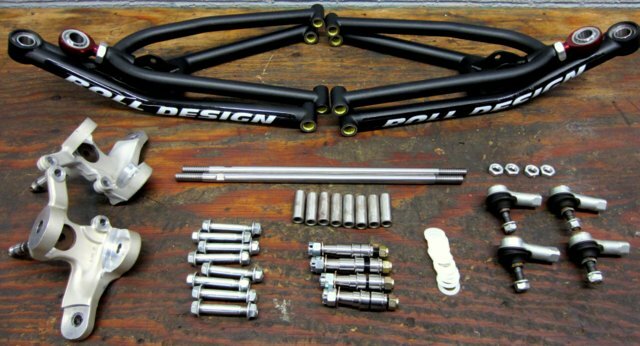 The bar clamps are Roll Design 1 1/8″ for Fat Bars. The brake lines are steel braided Duncan +2″. This is a good pic of the GPR installed. The linkage has quick-release ends on it so that it can be removed easily by hand, which makes swapping the damper out very easy and quick. 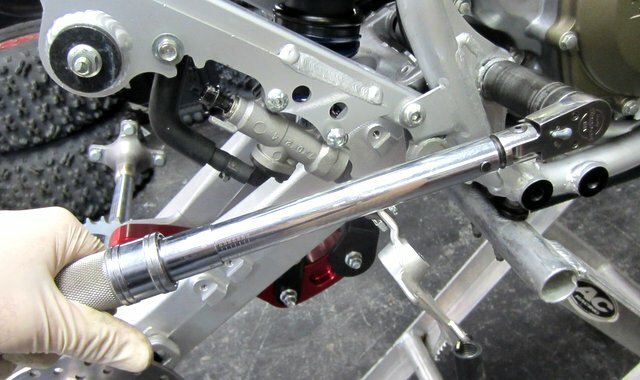 The brake line tee is bolted onto the frame with a longer bolt so that a nut can be threaded on the opposite end to reduce the chances of the bolt coming loose and falling out. 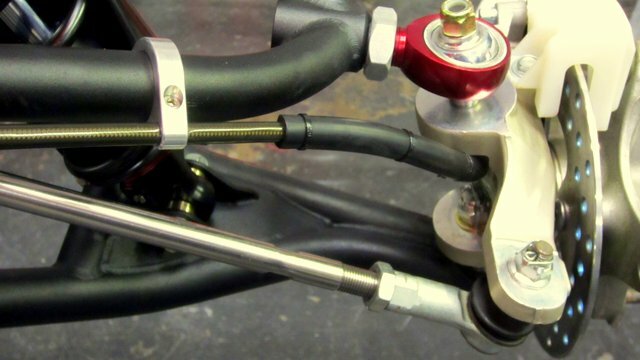 The brake line tee does not require teflon tape due to the type of fittings used. The bottom nut on the steering stem uses the OEM seal collar under it. The nut gets some medium Loctite and should be torqued to 51 ft.lbs. 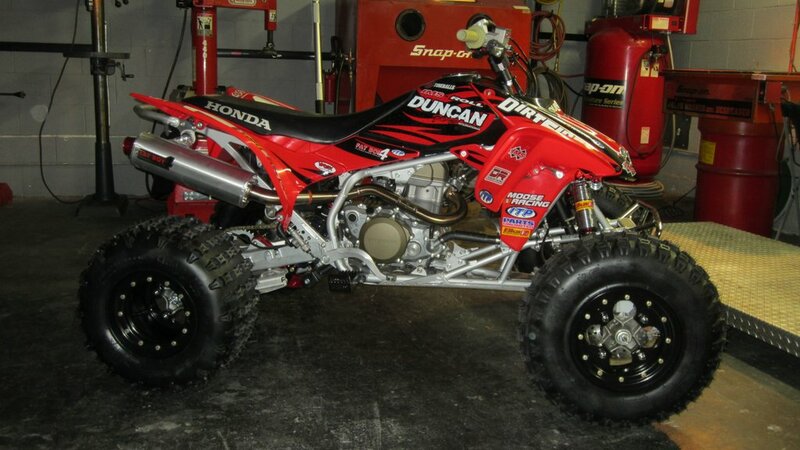 This is a MX/Desert Roll Design front end for 04-05 TRX450R’s. The original front spindles from the 08 were swapped out with 05 spindles. The tie rod ends are stock 08. 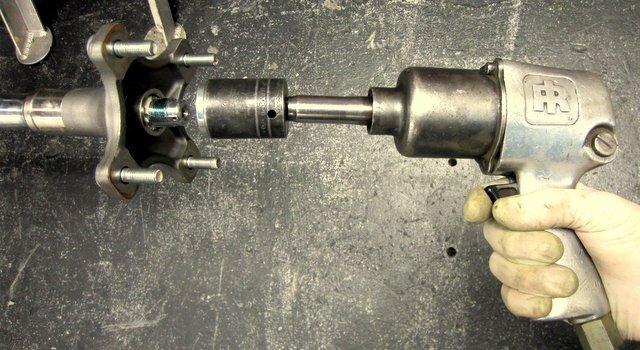 There are two things to look out for when mounting the balljoint adapters into the spindles. Make sure you put the short ones on the top and the long ones on the bottom, and make sure the cotter pin holes are positioned so that the cotter pins can be installed and removed easily. This picture shows the best cotter pin hole positioning. 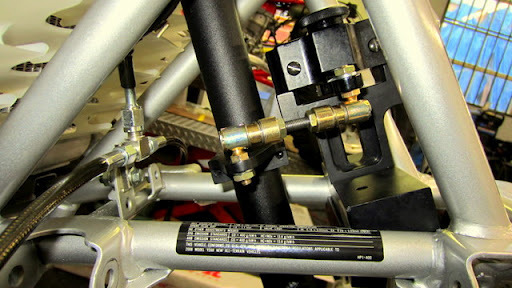 The front a-arm mount bolts are flipped around so that they can be removed without removing the front bumper. At this point the lower balljoint adapter nuts can be tightened. We use some loctite on these, because there is no cotter pin and the consequences of one of those nuts coming off while racing at high speed are very severe. The upper balljoints are left loose because they will need to be threaded in and out during the front end alignment process. The front hubs are 2005 450R. The calipers have been the same from 2004-2012. 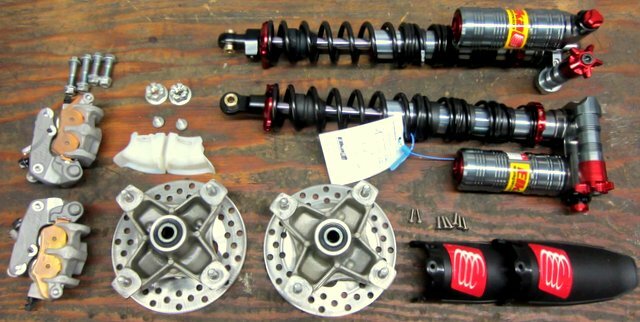 The front shocks are Elka Factory shocks, and measure 20″ from mount hole to mount hole. 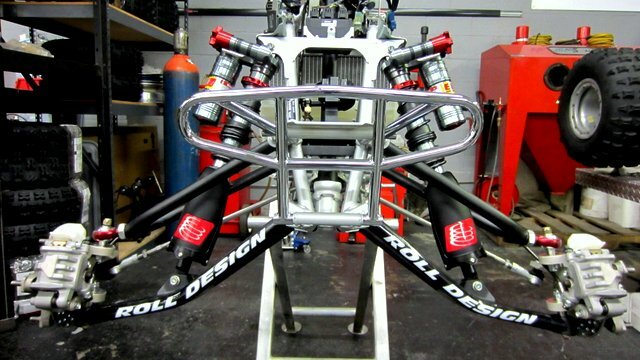 The Elka lower shock guards protect the surface of the chrome shock shafts from rock damage. Any imperfections in the chrome can make the shaft seals leak oil. The brake mounting bolts get loctite, as do the brake disc mounting bolts and the upper and lower shock bolts. A Duncan Racing front bumper looks good and adds a bit more protection than an aluminum front bumper. 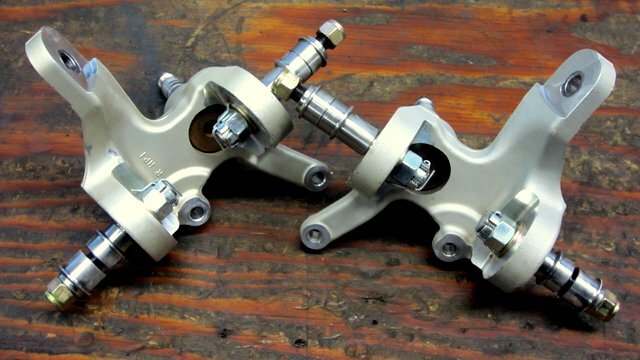 Here is a pic of the front brake line clamps, they are for 1″ diameter a-arms. We put some tubing over the brake lines in the spindle area, so there is no chance of the spindle rubbing a hole in the line. Just cut a slit in the tubing, slip it over the line, and zip tie it in place. 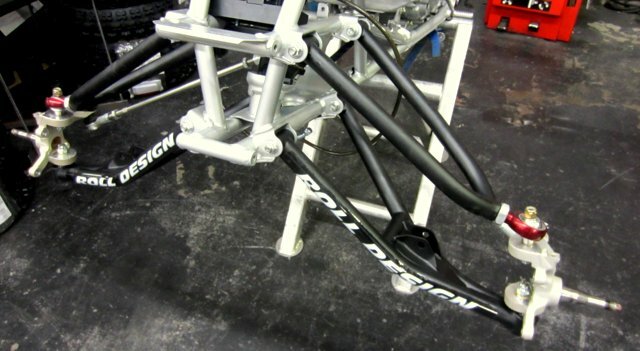 The rear swingarm from the 2008 gets swapped with a stock 2005 swingarm. 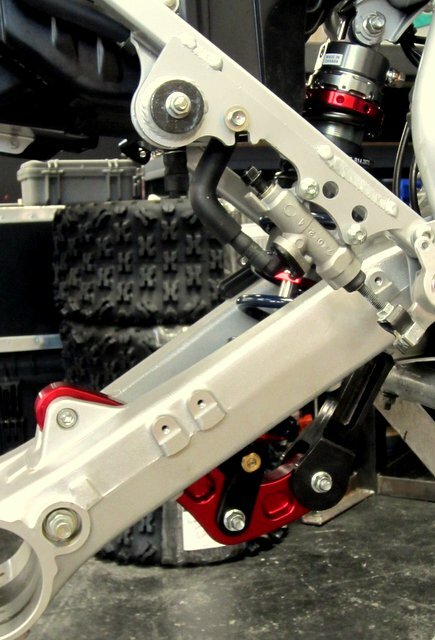 The ProDual Elka linkage and Factory shock are set up for that year of swingarm, and this combination works better in most applications than the later model setup due to the location of the linkage mount on the swingarm. 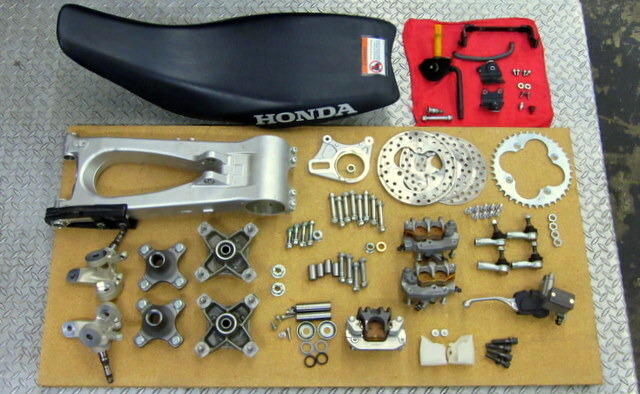 The 04-05 swingarms are 3/4″ shorter than the 06-later. 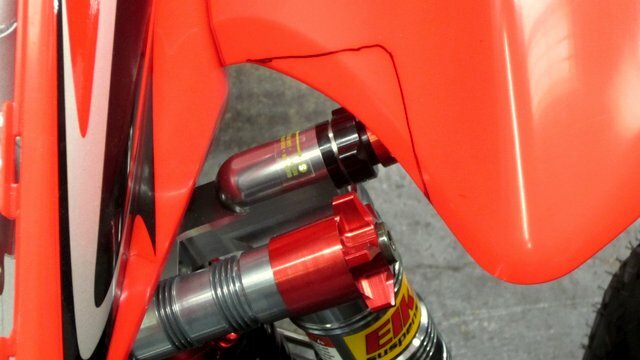 Most racers prefer the longer swingarm, as it makes the 450R hook up more predictably and wheelie less out of turns. The swingarm pivot bolt is a Walsh cr-mo bolt and the reservoir mount is made by Elka. The linkage comes with the bearings and seals already pressed in, but the collars are taken from the stock linkage. 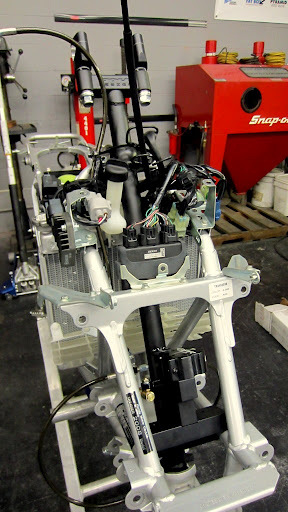 The rear shock is installed with the rebound adjuster positioned to the disc side so there is room to access it without having to take the skidplate off. 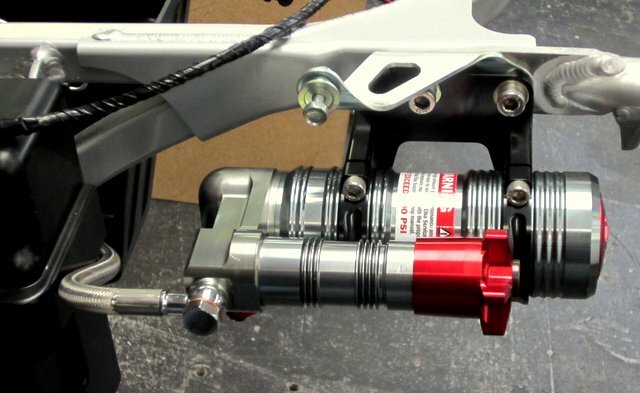 The upper shock mount bolt is installed from the left side of the quad so it can be removed without taking the exhaust off. We Loctite the shock and linkage bolts. The Elka reservoir mount makes for a really clean mounting position. Now is a good time to swap out the upper subframe mount bolts with some longer 12.9 grade bolts. The stock bolts are notorious for breaking and backing out even with loctite on them. The 12.9 grade bolts are stronger, and the extra length allows you to put a locknut on the bolt. Loctite the bolt into the threads and the nut onto the bolt and you will not have any problems with your upper subframe bolts. 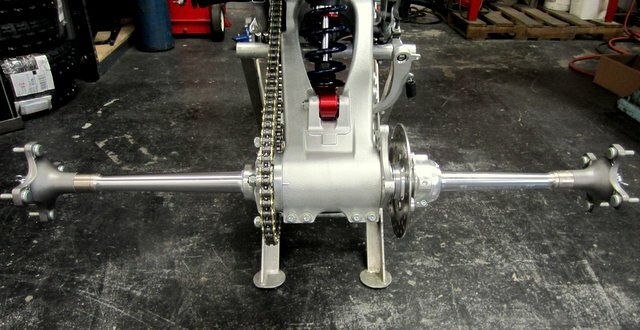 The RPM Dominator axle is currently the best axle available. You can order them with an extra thick sprocket hub that makes them even more indestructable. We prefer the twin row bearing carrier instead of the taper roller bearing carrier. The twin row bearing style allows the fade nut to be tightened against the bearings and hubs securely, where the tapered bearing configuration needs to be left slightly loose to avoid excess pressure on the tapered bearings. This allows the disc hub to move back and forth slightly during acceleration and braking. Our anti-fade nut of choice is a Lone Star part mainly due to the fact it has two 5mm pinch bolts instead of one. The chain is a Regina ORN 520×100 O-ring. We have used these chains since the 90’s with great results. The sprocket is the stock 38t steel, which is stronger than an aluminum sprocket. The wheel hubs are stock steel units. The rear caliper mount and brake disc are also OEM parts. 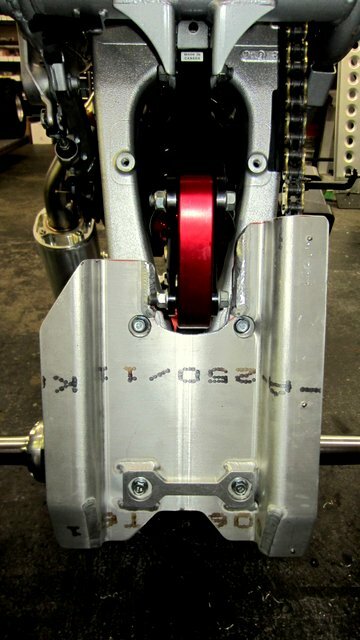 We set up the axle spacers as shown to make the front and rear the same basic width. The sprocket mount bolts and brake disc mount bolts get Loctite on them. 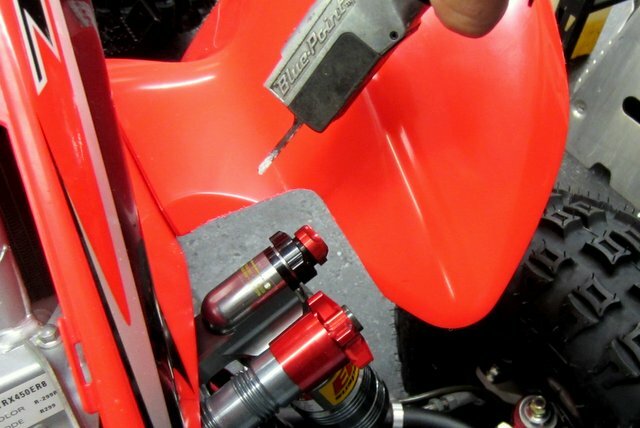 It is very important to install the swingarm pivot nut with a torque wrench. 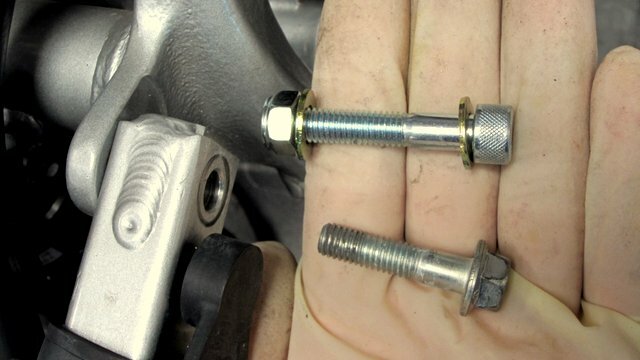 If the nut is not tightened enough it will come loose, if it is tightened too much it will stress the threads on the bolt and the bolt will fail prematurely. The rear hubs are installed on the axle with an impact gun. 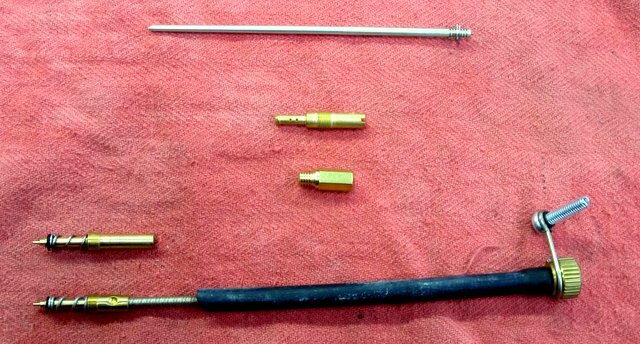 Generous Loctite is used on the axle threads, and of course a new cotter pin. 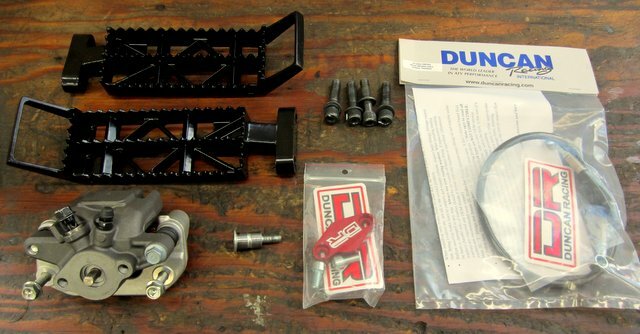 The rear brake system gets a Duncan steel braided brake line and parking brake blockoff plate. The Roll Design footpegs are very durable, offer excellent grip in wet/muddy conditions, and have mount holes to easily attach heel guards and/or nerf bars depending on what type of race the quad will be entered in. MX and WORCS races require nerf bars, but in Desert racing nerf bars are generally not used because they tend to catch rocks and plants. The rear caliper mount bolts get Loctite. The new brake line washers from the brake line kit are used. 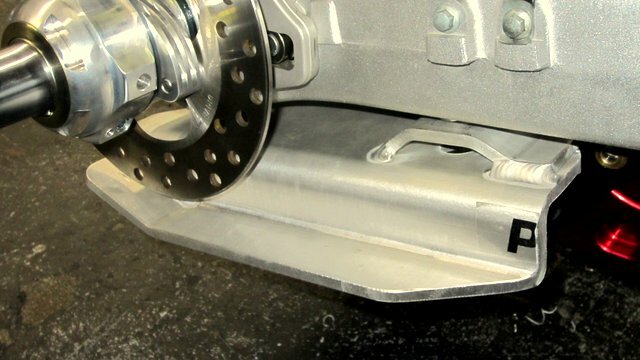 The parking brake blockoff plate is installed to keep dirt out of the caliper, there is an o-ring seal underneath that actually holds the brake fluid in. It is a common misconception that the blockoff plate holds in the brake fluid, but this is not the case. 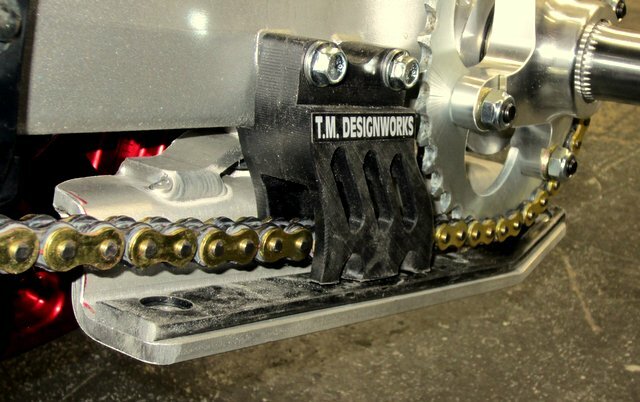 Chassis protection and drive chain guides are important in any type of racing, but in Desert racing it is absolutely vital due to the amount of unexpected and unavoidable impacts with rocks at high speeds. 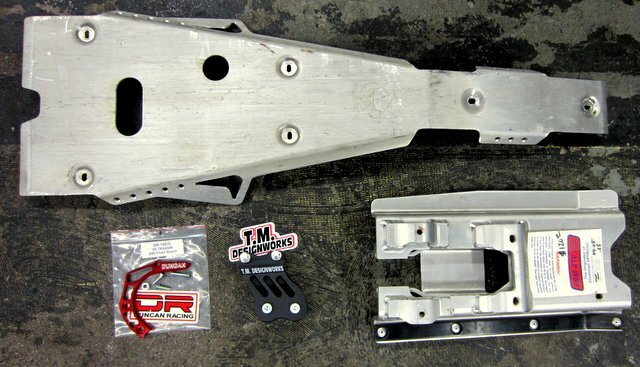 The swingarm skidplate starts out as a PRM Products .25″ thick aluminum skidplate. To clear the Elka linkage, the skidplate is cut as shown. The linkage is moved through the travel to make sure it does not bind at any point. The mount bolts are 10.9 grade and are installed with generous amounts of Loctite. The rear chain guide comes with M6x1 bolts to work with the original threaded mount holes in the swingarm. 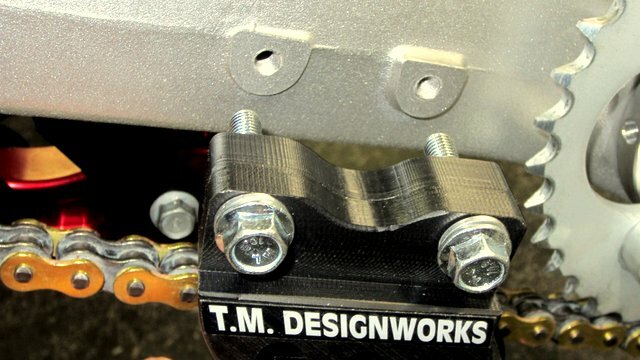 To make these mounts more durable, the holes in the swingarm are drilled and tapped to a larger M8x1.25 thread. The collars in the guide are also redrilled to fit the new 10.9 grade bolts. Loctite these for sure! The bottom of the chain guide is cut off close to the skidplate slider. If the chain guide does come off of the swingarm (if the bolts break), leaving the bottom of the chain guide open lets the guide fall completely of the quad instead of getting caught in the chain/sprocket and stopping the quad. This shows how the brake disc side of the skidplate is trimmed down, but still offers good protection for the disc. The controls consist of a set of Renthal CR Hi bend handlebars, Renthal dual compound grips, a Works Connection Elite clutch lever, a Motion Pro Vortex throttle and cable to work with the stock carburetor, and a Pro Design kill switch. The stock on/off switch is retained mainly for the start button, and makes things a little cramped on the bars. Some grip donuts are added between the grip and switch to cut down on hand irritation from rubbing on the switch housing. 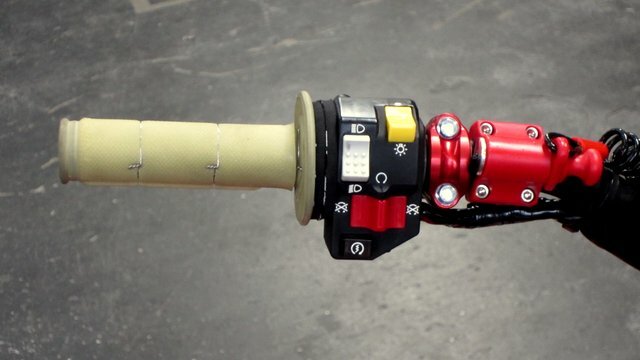 The Vortex is a 1/4 twist throttle for quick throttle action. The grips are glued on with Pro-Taper grip glue and safety wired in place. 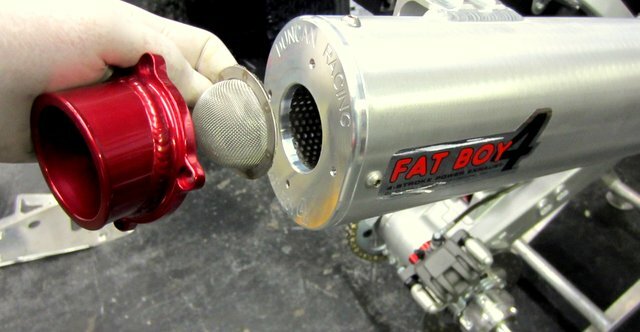 The exhaust system is a Duncan Racing Fat Boy 4. 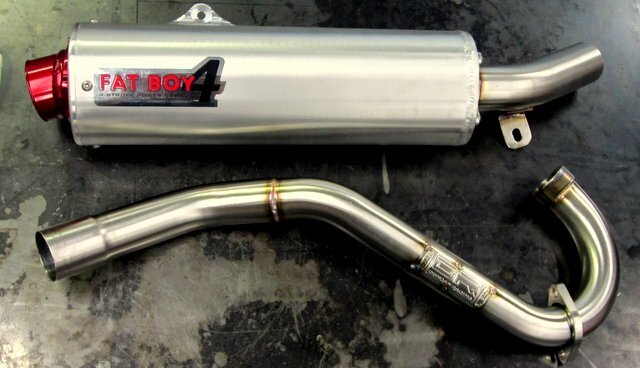 This pipe is very tough, makes great power, and is quiet enough to pass sounds tests at the track. The exhaust gasket that goes into the cylinder head exhaust port gets replaced every time the exhaust is unbolted because it is a hollow, crush-type copper ring that can only be used once. To make this quad pass tech at the desert races, a spark arrestor screen is bolted on beneath the end cap. 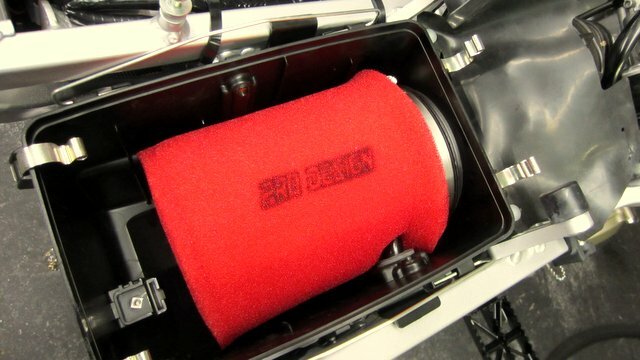 To let the motor breathe better and complement the free-flowing exhaust, we install a Pro Design filter kit. The kit comes with an aluminum insert ring for the airbox, and a two-stage foam filter. The foam filters don’t flow as well as a K&N, but they filter better. The filter is oiled down with foam filter oil. We will run no airbox lid. 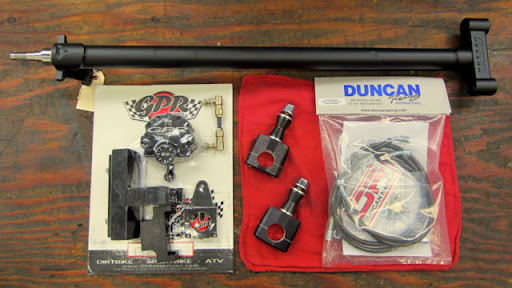 The parts for the modifications to the stock carb include: #48 pilot jet, #172 main jet, OBELR adjustable needle, and an R&D remote adjustable fuel screw. The picture above shows the original fuel screw next to the R&D setup. Having your fuel screw adjustment on the side of the carb where you can access it saves a lot of grief. We will start out with the needle clip in the center position. 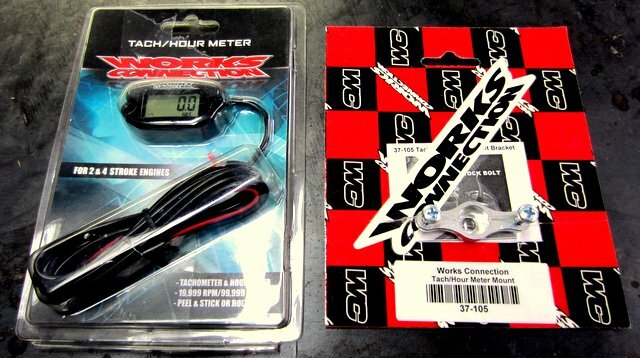 To monitor run time on the motor we will install a Works Connection hour meter. 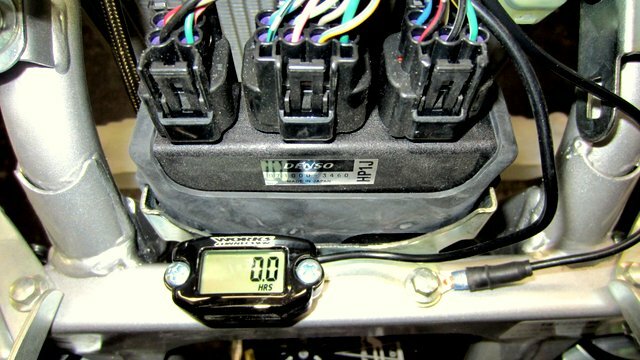 The Works Connection mount makes it easy to attach the hour meter on the frame in front of the CDI unit. To change the rev limit, this green wire is clipped. 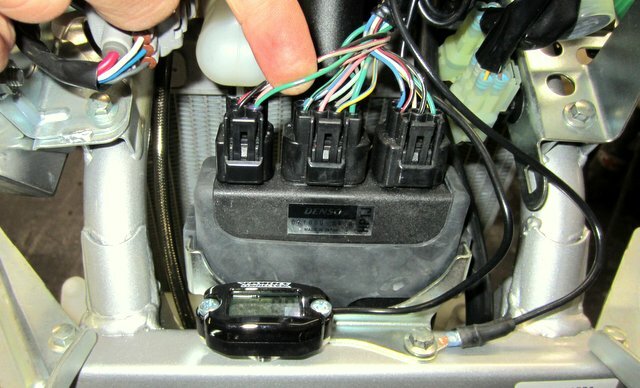 This is basically the same wiring modification that is done with the small sub-harness in the Honda HRC power-up kit, and lets the motor rev 1000rpm more before hitting the limiter. 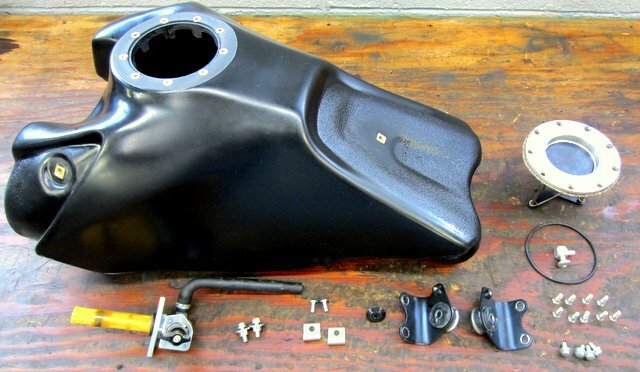 This IMS fuel tank holds almost 4 gallons, and is setup for a dry break receiver. Sometimes the tank needs to be clearanced so that the receiver slides up and down smoothly without rubbing on the inside of the hole, and its important to bolt the receiver in place and test it before installing the tank on the quad. A vent elbow is installed in the front of the tank by drilling a hole in the area just in front of the receiver, as high up as possible. It is also a good idea to wash out the tank with water, blow it out with compressed air, and let it dry completely. This will make sure that there are no bits of plastic left in the tank to clog up your petcock screen. The wheels we are using are DWT billet center Beadlocks. 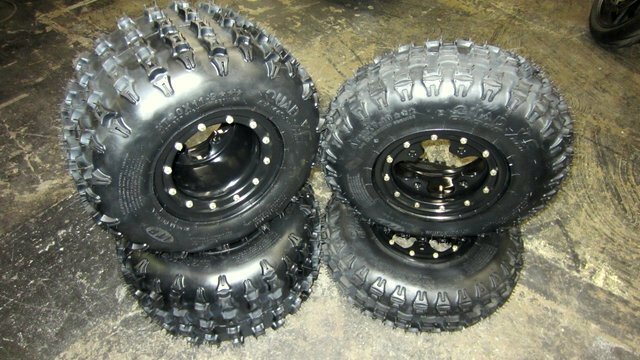 These tires are ITP Quadcross XC Pro, 20x11x9 rear and 22x7x10 front, which are used for WORCS races and GP’s. Tireballs are a must for racing, and this combination of tires and wheels takes 14 2003 Series balls at 8 psi of nitrogen in the front, and 12 2004 Series balls at 8 psi of nitrogen in the rear. No air is used in the tire itself. When mounting the front fenders, they need to be clearanced for the Elka shock reservoir and adjusters. The fenders are marked where they need to be cut. Then an air saw is used to make a clean cut, which is dressed up with a file. With the bodywork in place the project is almost complete. The final step is the decals and graphics that make the quad really stand out visually, and help promote all the companies that supply the great components. The final product is a quad that is ready to take on the toughest terrain and the most demanding race courses.